Oil markets remain highly volatile, with an early morning price dip giving way to a surge in prices as the market opened at 9:30. Yesterday saw prices fall $1.20, after gaining $1.50 the day before. Oil prices are dancing near the $65/bbl level. Those who were on the sidelines of the oil market recently, expecting prices to continue falling, are feeling nervous as significant new risk factors boost oil prices. Crude oil is currently trading at $65.25, a gain of 95 cents since yesterday. Fuel prices are also significantly higher following yesterday’s decline. Both gasoline and diesel prices fell yesterday, though nowhere close to giving up Wednesday’s gains. Today, both are nearly three cents higher. Gasoline prices are currently $2.0394, while diesel prices are $2.0202. There’s a financial flight from the U.S. underway, as President Trump appears to be pushing full gear to enact all the policies markets have feared since his election. After imposing steel and aluminum tariffs on all but the U.S. closest trading partners, Trump yesterday announced another $50-60 billion in tariffs and sanctions targeted at China. Markets fear a trade war is imminent, which could bring severe economic repercussions. Fears of slower economic demand led to yesterday’s large decline. Trump also chose John Bolton, an individual who advocated using military force against North Korea and Iran, as the new national security adviser. Combined with the termination of Rex Tillerson as Secretary of State, markets are now worried that U.S. foreign policy could become more aggressive in the future. Markets hate uncertainty, especially when the uncertainty is related to military action, so these fears have helped bring prices higher again. On Monday, China’s Shanghai international Energy Exchange (INE) will launch, becoming China’s first major futures market for crude oil. The launch will also be the first major crude benchmark in East Asia, which is important giving surging demand in the region. Oil will be denominated in Chinese yuan. Political pundits fear the move could upend global energy markets, propelling China to center stage. 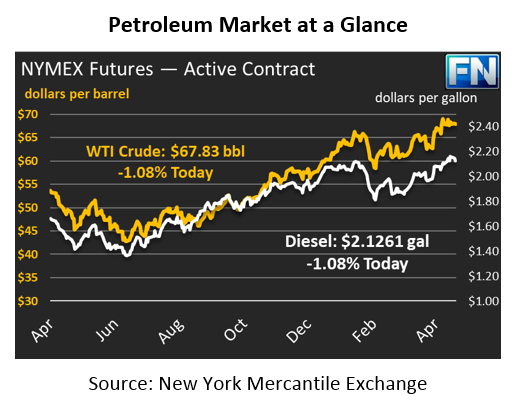 The other two major oil futures contracts, Brent crude (traded in London) and WTI crude (traded in New York) are both denominated in US Dollars, making the dollar an international requirement to trade oil. Having the new index trade in yuan would, in theory, steal credence from the dollar and help the yuan’s ascent to global currency dominance. At least, that’s how the story goes. In reality, China lacks the production muscle to support a global crude oil index, at least for now. The INE benchmark has just 20 million barrels of storage capacity at its delivery point, compared to roughly 85 million barrels of crude storage in Cushing, OK, the delivery point for WTI crude. Finally, international interest has been limited given the exchange rate concerns trading in and out of yuan. China is known for devaluing their currency, meaning they may lose money when they cash out of their position and convert back to dollars. While the new index will serve as the first stepping stone on the road towards energy dominance, China has a long way to go before the yuan becomes a major currency backing oil contracts. For U.S. buyers, the news matters because a new trading index could (in the long-term) remove liquidity from WTI and Brent markets. Lower liquidity would mean more price volatility, and would make it harder for oil producers to hedge their production. While there’s no direct up/down impact from the index, it does show an evolving center of power regarding energy production. Spreads between INE, WTI, and Brent will all impact international trade flows, exports, and imports.